GB Tell me why you chose the nest. SA I don’t think there’s anything more beautiful than nature. I didn’t used to feel like that but the older I became the more I think that’s true. I see designers struggling to replicate it, and that’s impossible. You can never make something as beautiful as the real thing. I’ve always loved nests. I love my home. I’m a real homemaker. It’s just so painstaking and sweet and heartbreaking to see the amount of effort that’s gone into making this bird’s home – every tiny branch and piece of fluff. It’s amazing, the different things that comprise it. There are even bits of hair, whatever the birds can gather. When I was a child I used to imagine myself living in tiny spaces and this little bowl shape is so appealing somehow. And we call it nesting too. 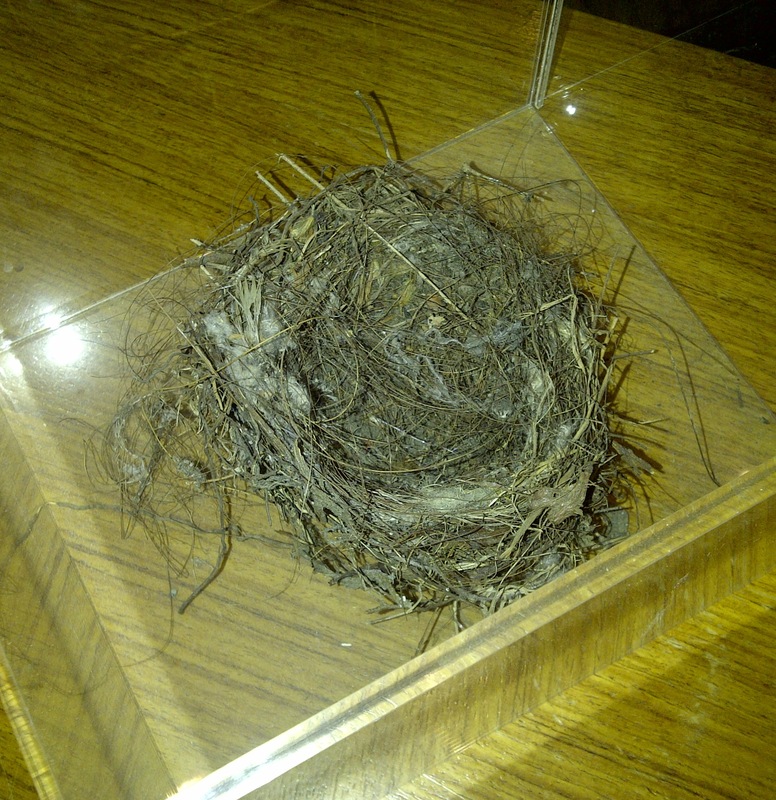 There’s something very symbolic about a nest. GB I think we feel quite protective towards nests for that reason. SA Nests and eggs are so fragile. I carried this home by hand being so careful it didn’t fall apart. It had just fallen out of a tree and I put it in this Perspex box to preserve it. GB In your home, is the beauty more from art or decorative art? SA It’s a combination. It’s about colour and comfort and if I buy art I choose it on a visceral level, not for any other reason. GB You make lovely jewellery with birds on it. Have you always been drawn to them? SA Not especially but I love that there is such a variety of species. I like pelicans the most. I just came back from the Caribbean and there was a pelican circling the beach the whole time we were there. They just look so prehistoric. GB In your work you’re dealing in beauty. Is that one of the foremost considerations when you’re making something? SA I live my life trying to make it as beautiful as I can in every way possible. I don’t know if that’s a shallow consideration. Sometimes it seems that way and yet there’s something so life enhancing about being surrounded by beauty. For me it’s very visual and it really lifts my spirits. GB Do you think that creating something beautiful makes life more fulfilling? SA Yes, although I’m envious of people who can create something beautiful completely on their own like writing beautiful prose or playing the piano. I need a whole load of people to help me! But that process and struggle means that the end result is more fulfilling. GB People seem to like jewellery that’s meaningful to them in a way that goes beyond beautifying themselves. Do you find that? SA Yes, I’ve been wearing the same necklace for 15 years and I don’t really know why. It’s not my favourite design. I’m just drawn to it. It’s a big lump of rough diamond that I’ve chained up and every time I change my necklace I don’t manage to do it for more than a day or two. It’s not because I love it the most that I want it. I have a ring that I wear every time I travel and if I don’t wear it I feel worried. It’s like a small prayer. A physical embodiment of a prayer. SA It has to move me. It’s something that your eye can’t stay away from, that makes you feel happy, that’s life enhancing.